Davenport Mobile App | Davenport & Co. 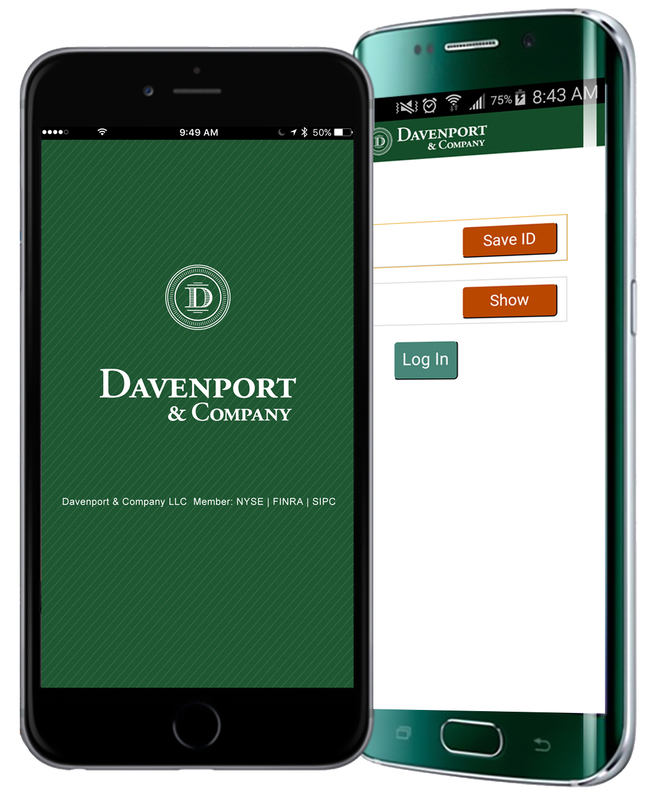 The Davenport Mobile App gives you greater accessibility to your account information, allows you to set up a watch list for your favorite stocks, displays market data and quote information, and allows you to deposit checks from your mobile device into your account. See below for important information about installing the App on your device. You must be a Davenport client with an online account to use the App. The App is designed to be a quick account overview, it isn't meant to take the place of Davenport Online and it is not meant to be a full examination of your account. For full access to your account information, or to enroll, visit Davenport Online. For assistance, contact Davenport Client Services at 1-888-742-1863. Please ensure that your device is updated with the most current operating system. If your device is not listed above, you will not be able to use the Davenport Mobile App. In Search box, type "Davenport Mobile"